All bedrooms are tastefully furnished, bright and comfortable to sleep in. Enjoy cooking in the open with a great BBQ facility and outside dining area. 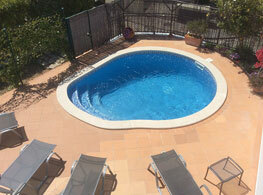 A great place to splash around in, cool down and relax! Villa Folly, a luxury holiday home in Vale do Lobo, Portugal is a beautiful end of terrace villa. It is situated in Vale do Lobo’s Vale das Flores zone where the design of each villa has been individually tailored to suit the requirements of the owners. Villa Folly enjoys bright, spacious living accommodation and suits the needs of both adults and children. It is furnished to a modern and high standard to facilitate minimal maintenance, and complements a comfortable and relaxing holiday whilst retaining a friendly and homely atmosphere. 4.8/ 5 stars - The Villa Folly review score is based on feedback from guests from around the world. See homeaway.co.uk for full, detailed reviews by our guests.